Hello dear followers, with spring finally looking like it's making it's way here I have another Spring/Summer collection from Kinetics, this set is the Magnolia collection. It consists of 10 shades mostly comprised of soft spring pales and bright summer red tones. This collection was released in March (I do apologize for the delay of reviewing these polishes!). Today I have half of the collection swatched and ready to share. Just Married is a off white creme polish, it isn't stark a white but has a touch of grey in it. I feel like it would be similar to OPI- My Friend Scales The Walls. I always steer clear of white polishes because I worry it would look like white out on the nails but I was pleasantly surprised at how flattering this shade was. Like with most white polishes, this one was a little finicky too and I had to use 3 coats for full coverage. Blue Jasmine has got to be my favourite from the collection, in the bottle it looks like a pastel periwinkle and dried just a touch lighter. It is quite sheer on the first coat but can be easily built up to a strong opaque shade in 3 coats. The colour reminded me a beautiful sunny spring day, the blue is soft yet vibrant. Totally worth the work of 3 layers. Mint Sky is a shade I can't say we haven't seen before. The popular mint green seems like a colour that has been popular for many seasons. This shade leaned more towards a greyish pastel green. I would say China Glaze - At Vase Value would be a close dupe of the shade, Mint Sky being a touch more saturated in green. Application was super easy and went on like butter, I used 2 coats for opacity but I'm sure you could use 1 thick coat for almost the same result. 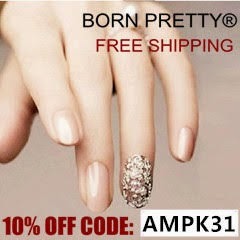 I wish ALL polishes were formulated as great as this one. 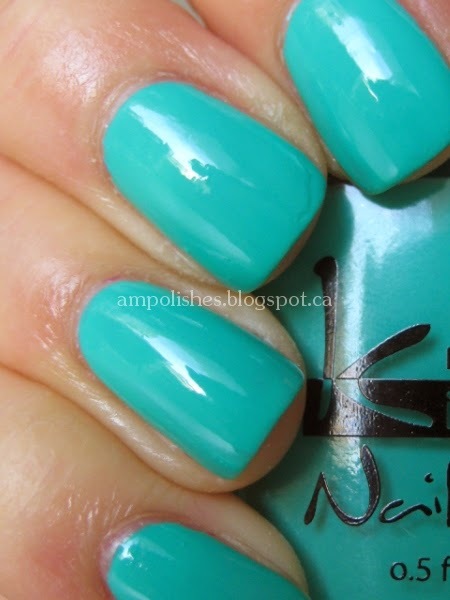 Never Too Late is a vibrant kelly green, it reminds me of China Glaze - Four Leaf Clover. I used 2 coats in my swatches but again, this shade could pass off as a 1 coater and dries to a glossy finish. That is one great thing about Kinetics nail polishes, they always dry to a super duper glossy shine so a topcoat is never a requirement. Love it! Note: This colour was much more green in person, my camera would not capture the accurate colour no matter what I did. 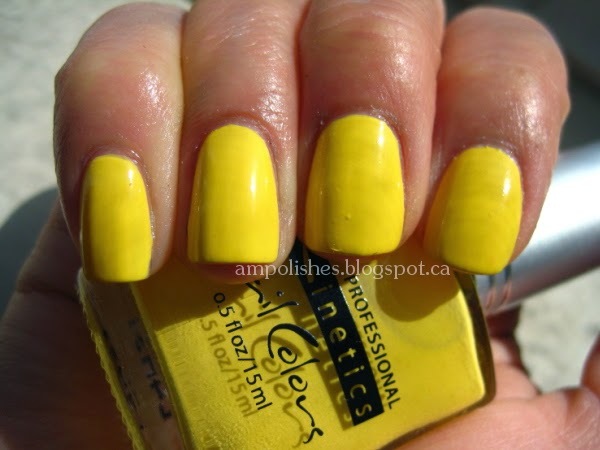 Narcissus is a bright sunflower yellow, it is very vibrant and makes me think of the summer sunshine! Like white, yellow is another shade of polish I have difficulty with. It isn't a colour that I would pick out first and I find isn't the most flattering on my pale skin. I think this yellow would be best suited for darker skin tones or if I had a tan. A little difficult to work with as well, I had to use 3 coats to cover all the streaks. 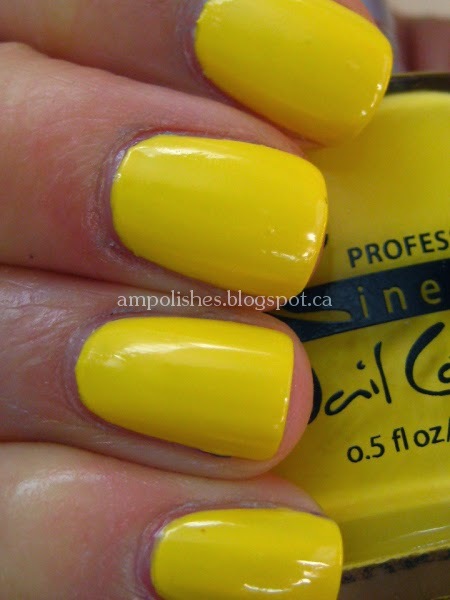 At first I thought this shade was the glossy version of Lemon Drop from their Hello, Ice Cream! 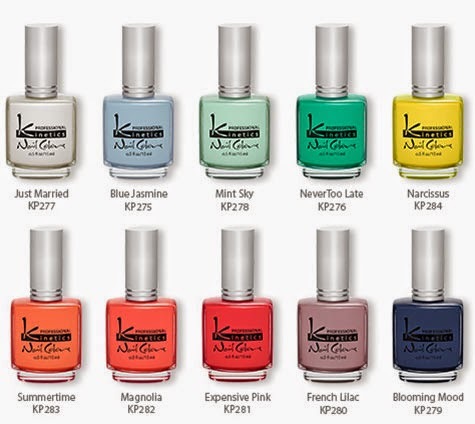 Collection but clearly not, Narcissus is brighter while Lemon Drop is more neon. 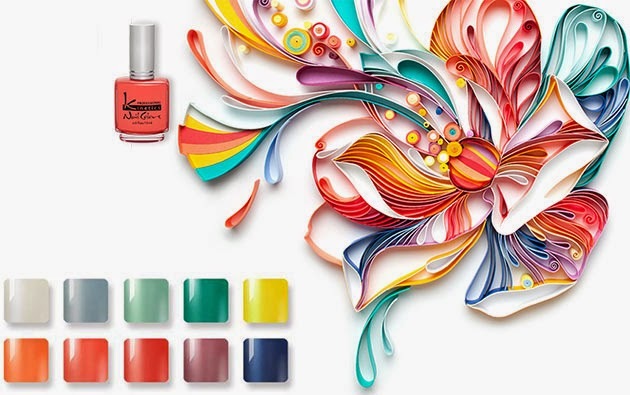 Once again Kinetics has come out with a high quality collection of polishes that don't disappoint with performance. Some of the colours in this collection may not be colours we haven't seen before but I think the quality gives the polishes more appeal. Each bottle is 15ml/ 0.5fl oz in size. Stay tooned for part 2! Spring 2014 NARS & Shiseido Warehouse Sale!